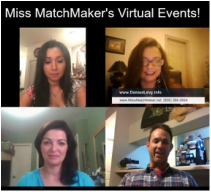 ​Subscribe to our Free Web Events as we discuss All Things Dating! You will have access to previous Web Events and be notified of all Upcoming Local & Web Events! On Web Events you can join the conversation in video, comments or questions if you are signed into your twitter or facebook! ​Please be sure to let us know who referred you! By subscribing you are helping your friend earn points for Coaching or MatchMaking! Do YOU want to earn points towards Date Coaching or MatchMaking? Click the "Share the Love" button below and learn more!